The present invention includes compositions suitable for use in a hemostatic device and hemostatic devices utilizing such compositions, as well as methods of making the compositions and the medical devices utilizing such compositions, where the compositions contain biocompatible, oxidized cellulose particles having an average designated nominal particle size of about 0.035-4.35 mm and a biocompatible, water-soluble or water-swellable polysaccharide porous binder component. The present invention is directed to compositions suitable for use in a hemostatic device and hemostatic devices utilizing such compositions, where the compositions comprise biocompatible, oxidized cellulose particles having an average designated nominal particle size of about 0.035-4.35 mm; and a biocompatible, water-soluble or water-swellable polysaccharide porous binder component. The invention also is directed to methods of making the compositions and the medical devices utilizing such compositions. FIG. 2 a is a scanning electron microscopy image (X50) of the first surface of a wound dressing described in example 1c. FIG. 2 b is a scanning electron microscopy image (X250) of the first surface of a wound dressing described in example 1c. FIG. 3 a is a scanning electron microscopy image (X50) of the second opposing surface of a wound dressing described in example 1c. FIG. 3 b is a scanning electron microscopy image (X250) of the second opposing surface of a wound dressing described in example 1c. FIG. 5 a is a scanning electron microscopy image (X50) of the first surface of a wound dressing described in example 1b. FIG. 5 b is a scanning electron microscopy image (X250) of the first surface of a wound dressing described in example 1b. FIG. 6 a is a scanning electron microscopy image (X50) of the second opposing surface of a wound dressing described in example 1b. FIG. 6 b is a scanning electron microscopy image (X250) of the second opposing surface of a wound dressing described in example 1b. FIG. 8 a is a scanning electron microscopy image (X50) of the first surface of a wound dressing described in example 1a. FIG. 8 b is a scanning electron microscopy image (X250) of the first surface of a wound dressing described in example 1a. FIG. 9 a is a scanning electron microscopy image (X50) of the second opposing surface of a wound dressing described in example 1a. FIG. 9 b is a scanning electron microscopy image (X250) of the second opposing surface of a wound dressing described in example 1a. FIG. 10 a is a scanning electron microscopy image (X50) of a cross section of a hemostatic device described in example 3. FIG. 10 b is a scanning electron microscopy image (X250) of a cross section of a hemostatic device described in example 3. FIG. 11 a is a scanning electron microscopy image (X50) of a surface morphology of a hemostatic device described in example 3. FIG. 11 b is a scanning electron microscopy image (X250) of a surface morphology of a hemostatic device described in example 3. FIG. 12 a is a scanning electron microscopy image (X50) of an agglomerate described in example 4. FIG. 12 b is a scanning electron microscopy image (X250) of an agglomerate described in example 4. FIG. 13 is a scanning electron microscopy image (X50) of a surface morphology of the micro-fibers described in example 2. Embodiments of the present invention include the use of oxidized cellulose particles that are derived from absorbable hemostatic fabrics that are warp knitted tricot fabrics constructed of bright rayon yarn which is subsequently oxidized to include carboxyl or aldehyde moieties in amounts effective to provide the fabrics with biodegradability and anti-microbial activity. The fabrics are characterized by having a single ply thickness of at least about 0.5 mm, a density of at least about 0.03 g/cm 2, air porosity of less than about 150 cm3/sec/cm2, and liquid absorption capacity of at least about 3 times the dry weight of the fabric and at least about 0.1 g water per cm2 of the fabric. where x and y represent mole percent, x plus y equals 100 percent, x is from about 95 to about 5, y is from about 5 to about 95; and R may be CH 2OR3, COOR4, sulphonic acid, or phosphonic acid; R3 and R4 may be H, alkyl, aryl, alkoxy or aryloxy, and R1 and R2 may be H, alkyl, aryl, alkoxy, aryloxy, sulphonyl or phosphoryl. where x and y represent mole percent, x plus y equals 100 percent, x is from about 95 to about 5, y is from about 5 to about 95; and R is CH 2OH, R1 and R2 are H.
Depending on the conditions to which the homogenous dispersion is subjected, the compositions may be in various forms. For example, the compositions may be in the form of a porous foam, whereby the oxidized cellulose particles are dispersed in a porous foam binder component to form a porous foam sponge, as depicted in FIGS. 1 thru 9 b and as described in Examples 1a-1c; or to form porous foam beads as depicted in FIGS. 10a thru 11 b and as described in Example 3, depending on the methods used to prepare the composition. In such cases, the particles may be bound within the structure of the porous foam binder component where they may provide hemostatic properties to the composition. At the same time, the porous nature of the polymeric binder component allows greater exposure of the binder to water within the body. The compositions also may take the form of a porous agglomerate of particles and polymer binder, as depicted in FIGS. 12a and 12 b and as described in Example 4. In such a case, the porous polymeric binder component may take on a more fibrous structure that is intertwined with the oxidized cellulose particles, as opposed to a foam structure of the sponge or beads. Again, the porous nature of the agglomerates, due in part to the fibrous structure of the binder component, permits greater exposure of the polymer binder to the water in the body. In both cases, the surface area of the binder is maximized so as to provide faster and more extensive hydration by water in the body, which in turn leads to faster and more extensive sealing properties to aid in the hemostatic properties of the oxidized cellulose particles. Such compositions may be further processed into various hemostatic devices. Hemostatic devices of the present invention are best exemplified in the figures prepared by scanning electron microscope. The samples were prepared by cutting 1-cm 2 sections of the dressings by using a razor. Micrographs of both the first surface and opposing second surface, and cross-sections were prepared and mounted on carbon stubs using carbon paint. The samples were gold-sputtered and examined by scanning electron microscopy (SEM) under high vacuum at 4KV. CORC Fibrillar was first immersed in liquid nitrogen in a stainless steel foil pouch then the LN 2 containing pouch filled with CORC Fibrillar will go through a dual wheel/roller at 6 in/min, yielding CORC powders, micro fibers or fine particles of various length/sizes. Particles of desired sizes can be subsequently separated with USA standard Testing Sieves (A.S.T.M.E.-11 Specification) of different mesh sizes (20-400), yielding micro-fibers of length ranging from 0.035-0.86 mm. CORC particles/powders/micro fibers thus prepared were placed in the CMC—Na solution in the crystallization dish. The suspension of the CORC particles/powders/micro fibers in CMC—Na solution was placed in an Ultra-TURRAX® T18 DIXI midi Dispersers/Homogenizers homogenizer and homogenized until the loose CORC particles/powders/micro fibers are evenly distributed in the CMC—Na (Aqualon® 7M8SF) solution. The homogeneous solution was then lyophilized in the dish overnight. A very flexible patch was formed (basis weight=40, thickness=5 mm). The patch was further dried at room temperature under vacuum. CORC Fibrillar is first emerged in liquid nitrogen in a stainless steel foil pouch then the LN 2 containing pouch filled with CORC Fibrillar will go through a dual wheel/roller at 6 in/min, yielding CORC powders, micro fibers or fine particles of various length/sizes. Particles of desired sizes can be subsequently separated with sieves. CORC particles/powders/micro fibers thus prepared were placed in the CMC—Na Aqualon® 7M8SF solution in the crystallization dish. The suspension of the CORC particles/powders/micro fibers in CMC—Na solution was placed in an Ultra-TURRAX® T18 DIXI midi Dispersers/Homogenizers homogenizer and homogenized until the loose CORC particles/powders/micro fibers are evenly distributed in the CMC—Na solution. The homogeneous solution in the dish was transferred via a tube into LN2 bath. The CORC/CMC—Na suspension was instantly freezed yielding micro-porous beads of various diameters, ranging from 0.2-9 mm, and lyophilized overnight. The micro porous-beads were further dried at room temperature under vacuum. CORC Fibrillar is first emerged in liquid nitrogen in a stainless steel foil pouch then the LN 2 containing pouch filled with CORC Fibrillar will go through a dual wheel/roller at 6 in/min, yielding CORC powders, micro fibers or fine particles of various length/sizes. Particles of desired sizes can be subsequently separated with sieves. CORC particles/powders/micro fibers thus prepared were placed in the CMC—Na (Aqualon® 7M8SF) solution in the crystallization dish. The suspension of the CORC particles/powders/micro fibers in CMC—Na solution was placed in homogenizer and homogenized until the loose CORC particles/powders/micro fibers are evenly distributed in the CMC—Na solution. The homogeneous solution in the dish was transferred via a tube into Isopropanol (IPA) bath to facilitate the precipitation of CORC/CMC—Na composite. Excess amount of (80-95%) of IPA was removed from the precipitated CORC/CMC—Na composite, then the CORC/CMC—Na composite was instantly freezed yielding fibrous agglomerates of various form and lyophilized overnight. The fibrous agglomerates were further dried at room temperature under vacuum. wherein said composition is suitable for use in a hemostatic device. 2. 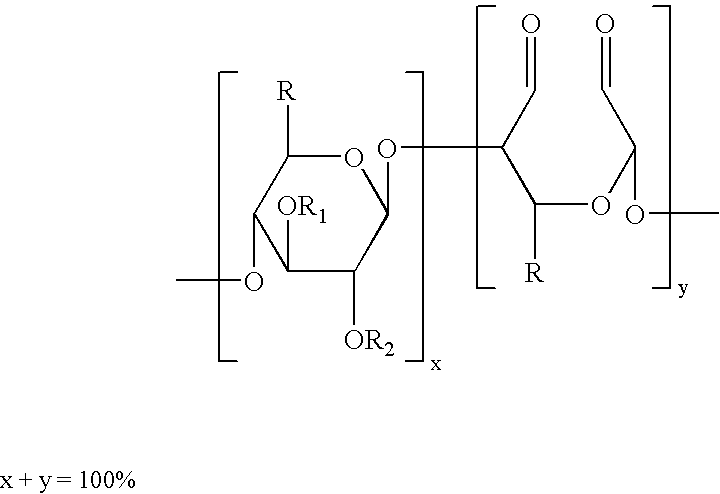 The composition of claim 1 wherein the oxidized cellulose is selected from the group consisting of carboxylic-oxidized cellulose or aldehyde-oxidized cellulose. 3. The composition of claim 2 wherein said water-soluble or water-swellable polysaccharide is selected from the group consisting of methylcellulose, hydroxyalkyl cellulose, salts of carboxymethyl cellulose, carboxymethyl cellulose and carboxyethyl cellulose. 4. The composition of claim 2 wherein said water-soluble or water-swellable polysaccharide is sodium carboxymethyl cellulose. 5. The composition of claim 1 wherein the weight ratio of said water-soluble or water-swellable polysaccharide to said oxidized cellulose particles is from about 1:99 to about 20:80. 6. The composition of claim 4 wherein the weight ratio of said sodium carboxymethyl cellulose to said oxidized cellulose particles is from about 3:97 to about 10:90. 7. The composition of claim 6 wherein said particles comprise fibers. 8. The composition of claim 7 wherein said fibers have an average designated nominal particle size of from about 0.68 to about 4.35 mm. 9. The composition of claim 1 comprising a sponge having said oxidized cellulose particles dispersed through said binder component. 10. The composition of claim 1 comprising an agglomerate of said oxidized cellulose particles and said binder component. a biocompatible, porous water-soluble or water-swellable polysaccharide binder component. 12. The hemostatic device of claim 11 wherein the oxidized cellulose is selected from the group consisting of carboxylic-oxidized regenerated cellulose or aldehyde-oxidized cellulose. 13. The hemostatic device of claim 12 wherein said water-soluble or water-swellable polysaccharide is selected from the group consisting of methylcellulose, hydroxyalkyl cellulose, salts of carboxymethyl cellulose, carboxymethyl cellulose and carboxyethyl cellulose. 14. The hemostatic device of claim 12 wherein said water-soluble or water-swellable polysaccharide is sodium carboxymethyl cellulose. 15. The hemostatic device of claim 11 wherein the weight ratio of said water-soluble or water-swellable polysaccharide to said oxidized cellulose is from about 1:99 to about 20:80. 16. The hemostatic device of claim 4 wherein the weight ratio of said sodium carboxymethyl cellulose to said oxidized cellulose is from about 3:97 to about 10:90. 17. The hemostatic device of claim 16 wherein said particles comprise fibers. 18. The hemostatic device of claim 17 wherein said fibers have an average designated nominal particle size of from about 0.68 to about 4.35 mm. 19. The hemostatic device of claim 11 comprising a sponge having said oxidized cellulose particles dispersed through said binder component. 20. The hemostatic device of claim 11 comprising an agglomerate of said oxidized cellulose particles and said binder component. 21. The hemostatic device of claim 11 comprising said composition in the form of a powder, a patch, a plug, a slurry and a paste. removing said solvent from the solidified dispersion, thereby forming said composition comprising said particles and a porous, water-soluble or water-swellable polysaccharide polymer binder component. 24. The process of claim 23 wherein said oxidized cellulose comprise carboxylic-oxidized regenerated cellulose. 25. The process of claim 23 wherein said water-soluble or water-swellable polysaccharide polymer is selected from the group consisting of methylcellulose, hydroxyalkyl cellulose, salts of carboxymethyl cellulose, carboxymethyl cellulose and carboxyethyl cellulose. 26. The process of claim 25 wherein said polymer is sodium carboxymethyl cellulose. 27. The process of claim 26 wherein the weight ratio of said sodium carboxymethyl cellulose to said fibers or beads is from about 1:99 to about 20:80. 28. The process of claim 26 wherein the weight ratio of said sodium carboxymethyl cellulose to said fibers or beads is from about 3:97 to about 10:90. ES04253808T ES2349775T3 (en) 2003-06-25 2004-06-25 hemostatic devices and compositions comprising oxidized cellulose particles and a polysaccharide binder. MX2018005707A (en) 2015-11-06 2018-11-09 Ethicon Inc Compacted hemostatic cellulosic aggregates. DE3687660D1 (en) 1986-08-25 1993-03-11 Goodrich Co B F Dressing and process for its production. MXPA03006688A (en) 2001-01-25 2004-03-12 Nycomed Pharma As Carrier with solid fibrinogen and solid thrombin.